To find out what your home is worth, Click Here. Appointment to view this listing or questions? Property Type Apartment Unit Water City/Munic. 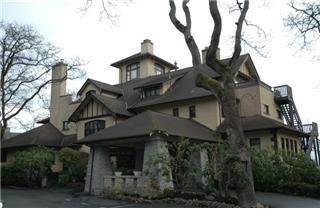 Spectacular character suite in a beautiful mansion located in Victoria's prestigious Rockland area. This suite has one of the best sea and mountain views in Victoria. Price just reduced $100,000 to reflect decreased square footage available to suite! Listing Brokerage(s): Pemberton Holmes Ltd.
*Listing information while deemed to be correct, is not guaranteed. Terrace Avenue, a winding hidden lane bordered by oak trees in prestigious Rockland. The Bowser Mansion was converted into 8 suites in 1976. This spacious main floor one bedroom unit maintians much of its original character and would be enhanced even more with remodeling. Grand living room, wood floors under the carpets, lots of windows, in-suite laundry and a large enclosed balcony, sea glimpses and garden views are some of the features to work with. Age 40+, No Pets. The potential here is amazing. Call for a viewing. Welcome to PeterVeri.com. Peter Veri services the Greater Victoria BC area. As a licensed realtor and an expert on real estate in Victoria, Peter gives his clients exceptional service whether they are buying or selling property. Peter Veri was formerly a certified Carpenter (21 years) with Redseal Designation. He pioneered the Home inspection business in Prince Rupert and Victoria. More recently, Peter took the required training through UBC to be a Municipal Building Inspector. Peter is now a full time REALTOR® and uses his past experience for current clients. Peter Veri said: "Since this is not my listing, I am not aware of any problems"; "I have a very good reputation, have never sold a leaky condo, and I feel strongly about protecting my good name." I have updated the posting. I also created a new posting for the information provided by the licensee who listed 8 1001 Terrace Avenue. I realize that the Real Estate Board says buyers should not rely on the information provided by realtors such as the listing agent and yourself. Buyers are explicitly told by Real Estate Boards not to rely on the information provided by the MLS system. Can you tell me where we can find the updated legislation “that says basically BUYERS MUST READ THE DISCLOSURE STATEMENT REGARDING LATENT DEFECTS BEFORE WRITING AN OFFER. This is a HUGE protection for buyers, because if there is a problem, it now needs to be disclosed before they start thinking of what price to put on paper.”? Can you provide me with a copy of the “THE DISCLOSURE STATEMENT REGARDING LATENT DEFECTS” for 1001 Terrace Avenue? Can you provide a copy of a recent FORM B Information Certificate? Do you commonly advertise properties as a buyer’s agent when you have not done due diligence? Do other realtors commonly advertise properties as agents for buyers when they have not done due diligence? Are you saying that realtors do not know what they are talking about? AUTOTEXTLIST s "E-mail Signature" Dr. James Balderson, Ph.D., Q.S. This beautiful residence was originally built for Premier Bowser and later converted into suites, this one being the largest. The 27 ft. living room (with inlaid hardwood floors) opens to the stunning, light-filled sunroom with 10 ft. ceilings and ocean views. The renovated kitchen has an office area which overlooks a private garden, the ocean and Mt. Baker. Perfect 1 level executive home - great for entertaining. Age restriction: 40 yrs and up. No Pets, no rentals. Ask Dallas about this property!